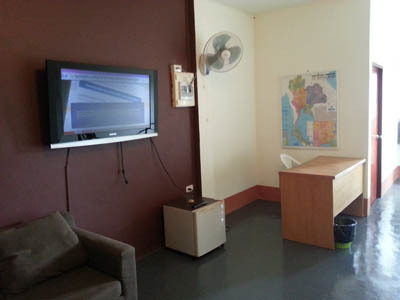 If you are looking for an apartment in Koh Chang, I recommend you this place which is located at Pearl beach, just 2 km south of White Sand beach and 1 km north of Chai Chet. It's nearby the post office and close to Big C and a big Tesco Lotus supermarkets, restaurants, pubs and other small businesses. The owners are living next to this apartment, you can always find them in case of a problem and they are super nice and extremely helpful. You can access to Pearl beach from the side road by walking 2 to 5 minutes. This pebble beach is very quiet. 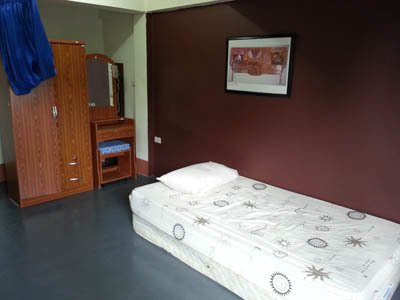 There are 2 apartments which can be rented per night, per week or per month depending on their availability and it's perfect for couples, families or groups of friends who cannot afford to rent 2 or 3 hotels rooms or bungalows or who just want something different than just a hotel or a resort. The biggest apartment is made of a large air-conditioned bedroom with a double-size bed, a smaller room with a single-bed, a large lounge with a sofa-bed, a bathroom with shower, a kitchen and a balcony. It's well furnished, you have inside a small fridge, a flat TV, free Wi-Fi, a microwave oven, a rice cooker, a grill, everything to be independent and spend your holiday time as you want. The second apartment which is the newest is on the first floor and is also well furnished. It's made of a main spacious room with a comfortable king-size bed, a dressing table, a kitchen and breakfast bar and a private terrace on the front side with tables and chairs. It also includes air-conditioning, a large fridge, a microwave oven, an electric grill, a kettle, a rice cooker and plates, cups, glasses, a smart TV with Netflix and cable TV and free Wi-Fi. You will also get a 20 litres water bottle which is replaced whenever you will need it. There is also a second room with bunk beds, perfect for kids and an en-suite bathroom with shower and hot water. Availability and best rates of Pearl Beach Holiday Apartments!